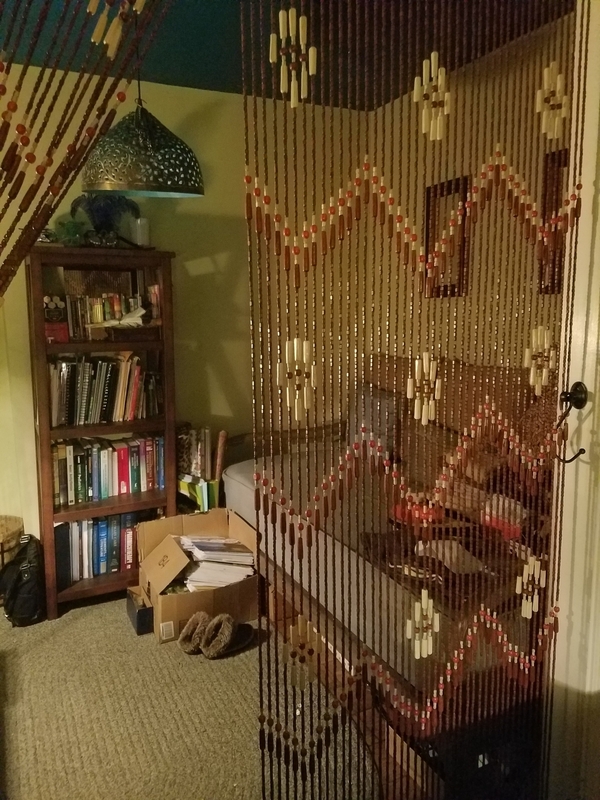 Our beautifully constructed wooden bead Shanghai curtains at ShopWildThings have a zigzag pattern created with light beige and brown beads in cylinder shapes on a dark brown and cherry red beaded circle. 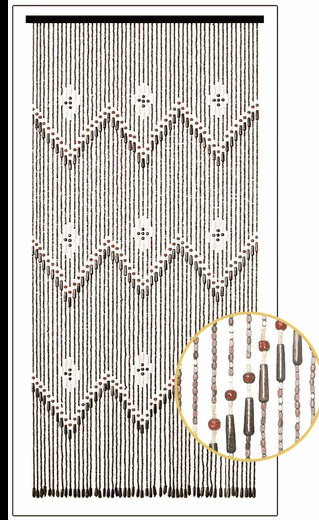 A brown wooden oval bead hangs from the end of each strand. Hang them as room dividers, wall hangings or fabulous backdrops at parties. 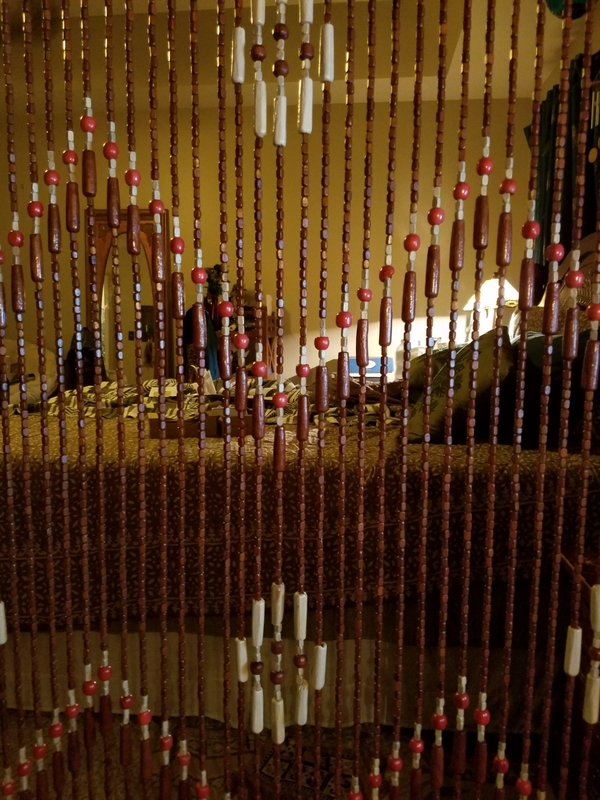 Each wood bead curtain is 35 1/4 inches wide and the strands are 76 inches long. With the 1" rod, the total length is 77 inches or 6.4 feet. Because this curtain is made from natural materials, every strand is not exactly the same length but the difference is very slight. 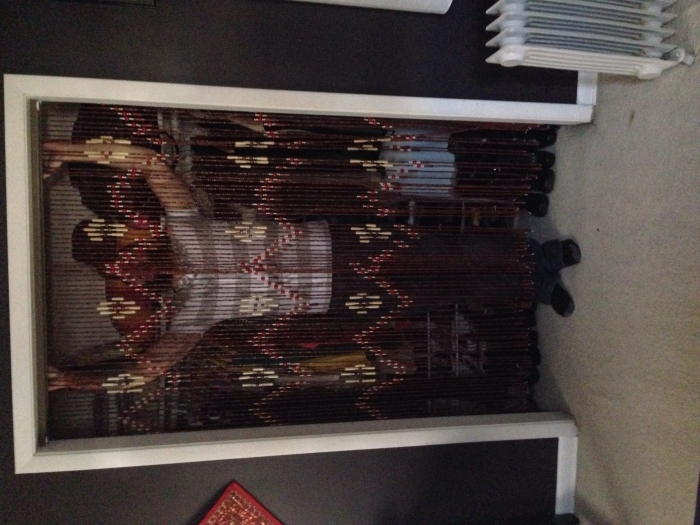 There are 52 strands of irregular-shaped square beads on each curtain. The header rail is dark brown with two eyelets for easy installation. Two minutes and two nails will do it. 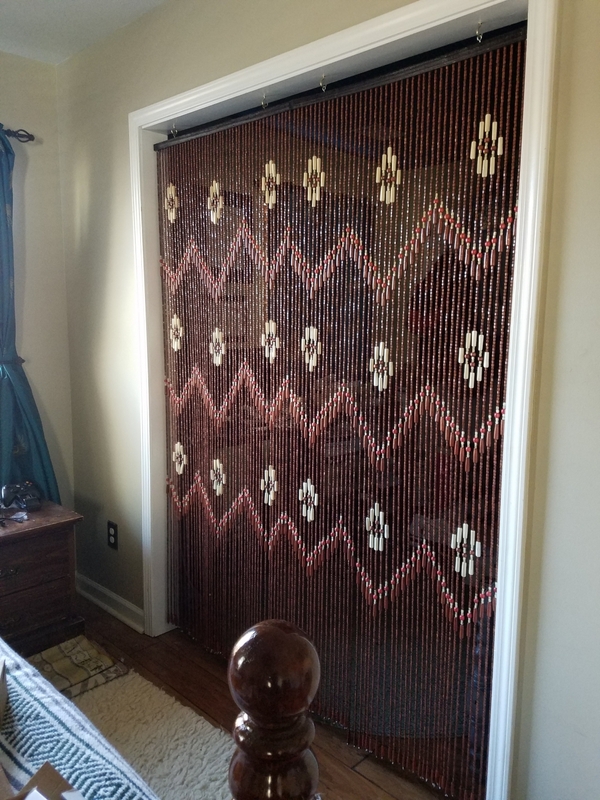 Watch our delightful video on this page to learn how easy and fast it is to hang beaded curtains. I purchased 2 of these to hang side by side in my sitting room doorway to help block the clutter. They do a fabulous job of partially obstructing the view while still allowing one to see through them. Well, this motivated me to just straighten up my sitting room! Haha. They add a nice ambiance to my room. The reason they get 4 stars instead of 5 is I'm not super crazy about the print, the beads are considerably uneven on one of the curtains, and one of the curtain posts was warped. Overall, not a deal breaker, as I really love them and think they add a great vibe to my room. The price is also very reasonable. Planning on purchasing 2 more for my prayer room downstairs. ConsWhen I trimmed them down to fit the doorway the print no longer matched up. 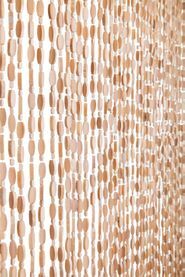 These are a great alternative to white painted doors. I really like this against the mahogany paneling I put up. I did buy a second and hung it behind to make a more dense curtain. Very Pleased! The curtain was a perfect fit and added the unique character and design I want for my living and dining area. I had removed the coat closet door and needed an item to add pizzazz to the room. I used two small "j" curved hook in the door frame and within minutes the room was enhanced 100%. ProsFit the inseam of the door perfectly. Natural look and beads. Easy to assemble and the height is a inch from the floor which is perfect too. ProsEasy to hang, colors are great, can use the two innermost strands as tie backs. This is very nice curtain. Came quickly. Easy to hang. It looks great. I'm very pleased with my purchase. 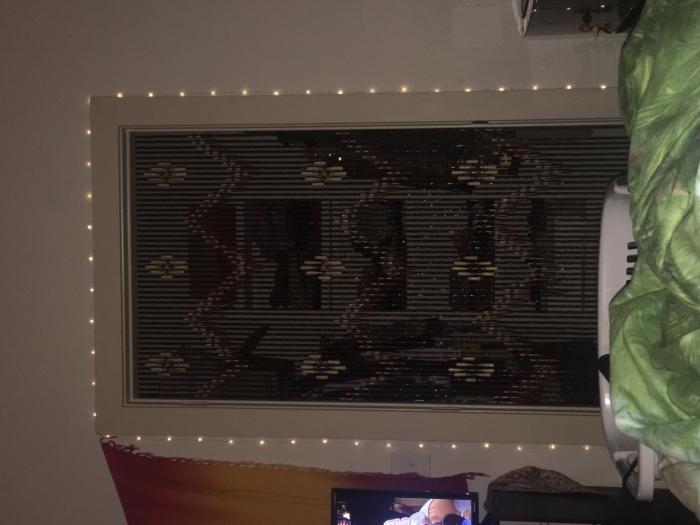 I loooove my new beaded curtains! They are perfect for my closet. Very well made and smell fantastic too! Believe it or not they smell like incense. The picture below is right before my boyfriend hung them up for me. ConsThe only thing was they didn't bring hooks to hang them with. The product came as described, colors are perfect in the opening of my front door. It is missing a strand of beads that is noticeable, and a few of the wooden beads are broke. After speaking with them, they have corrected this problem. Yes I would shop with them again. Very professional and courteous.